A go-to guide for you to get a clear speedy summary of why, what, how and how long. Do acrylic paintings really need to be varnished? If you want them to last in good condition for as long as possible; if you are professional and aim for the best quality in your artwork; if you want your paintings to be protected from light knocks and accumulated dirt over time; then yes, they do need to be varnished. How long do I have to wait to varnish an acrylic painting? Until it is dry, is the short answer. To dry and cure fully, acrylics take about a year. If you can wait that long, then that is ideal. They can, however, be varnished after about a month if needs be. And what if the painting is touch dry, sold and needs to be shipped? Varnish is better than no protection. Just remember that this final coat is meant to be thin! A thick coat on a fully cured painting may not cause any problems apart from raising a learned eyebrow, but on a touch dry painting it will significantly retard or even prevent the drying and curing process, with unpredictable consequences. Can an acrylic medium be used as a varnish? I've got one that's really clear and nice and glossy. Absolutely not. A medium and a varnish are formulated with totally different aims. A medium binds with the paint and should not be soluble. Mediums are not made to protect a painting from damage, they are made to change the working properties of the paint for your convenience. If a medium is used as a final layer, it binds intimately with the paint and is not possible to remove without accidentally removing paint at the same time, which obviously damages your painting. Clearly this is the opposite of your intention. Varnishes are designed to be durable, but they’re also formulated to be removable (or at least they should be). Solubility is one of the characteristics that distinguishes a varnish from a medium. When your painting needs a really good clean, it's the varnish that comes off and is actually replaced with a fresh coat. This top coat of varnish is available in matte, satin or gloss and is designed to be tough enough to give some physical protection against knocks, something that a medium is not designed to do. So the varnish just goes on top of the painting, right? No!!! Slow down. For acrylic paintings there's actually a step inbetween. First it's best to apply a slightly thinned coating of a gel medium prior to varnishing. This will protect the paint in case the varnish needs to be removed in the future. Why don't oil paintings require a layer between the paint and varnish? Because oil paints have much harder surfaces than even well dried acrylic paints, and the acrylic paint surfaces are very vulnerable to solvent penetration and even water penetration. Oil paint surfaces are vulnerable too, but much less so than acrylic paints. Why would the varnish need to be removed? Well part of the point of varnishing is to provide a dispensable layer that can be easily removed when it becomes too dirty to clean properly. A layer in between the paint and the varnish means that when the varnish is being taken off, it makes the conservators job that much easier in avoiding taking part of the painting off too. And what varnish to use? Well there are many suitable varnishes out there for acrylic paints. According to current best practice from a conservation point of view, choose an acrylic solution varnish or the one acrylic dispersion varnish made by Golden. As to how to varnish, you can't go past the instructions from AMIEN, available via the link below. 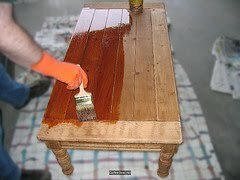 An excellent thread on varnishing on a top forum.